Who knows if these ghost stores are true? Over the years I have heard numerous Kerr County tales of haunted mansions, scary cellars, and walking spirits. And once, when I was in middle-school, a friend and I thought we saw a ghost downtown. Here a few of the most repeated ghosts stories of our community: Schreiner University: for many years residents of Delaney Hall have reported seeing a young cadet, in military uniform, who appears, salutes, and then disappears. He’s been known to open doors for students, as well. Nearby, between Delaney Hall and the creek, are the seven gravestones of the Harris family who once lived on a farm there. The stones are flush to the ground, they’re hard to find, but stories are told about the air being unusually cooler near that part of the campus. Several sites in downtown Kerrville have ghost stories attached to them. The old Arcadia Theater building once housed offices and shops on its second floor, including a jeweler who died in his little shop there. Some have claimed to hear the tapping of a small jeweler’s hammer near the spot his workbench stood. 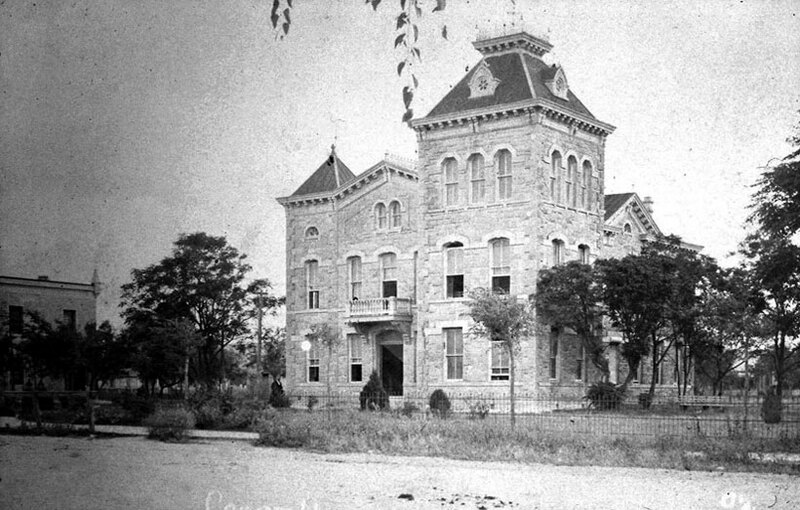 The Kerr County courthouse is the spot of two separate stories: The first involves a young couple who argued on the courthouse square, back in the late 1800s. Their disagreement turned deadly when the jealous young man shot and killed the woman, then later turned the gun on himself, right there in front of the old courthouse. Some people say, on moonless nights, you can see the pair in the shadows, and hear them yelling at each other, their fight never ending. The second story involves what was, for a while, the county jail. Looking at the front of the courthouse, you’ll notice a basement, two stories, and then a smaller third story at the top of the older part of the building. That third story was the county jail at one time. I’ve been up there -- it’s creepy even in the daylight. County employees felt the old jail was haunted by an inmate who died in custody years ago. Some report the room has many strange noises, like keys turning a lock, or metal banging against the old steel bars. Camp Verde, to the south of Kerrville, is also a spot with many ghost stories. Some have seen a ghostly line of camels, walking in line, passing through the trees and shrubs near the old fort. Others have seen troops running across the bridge there. Workers at the Camp Verde Store used to have stories of a ghost in the basement, an apparition they called Ruthie. She was a Civil War-era spirit who was a regular customer of the store when she was alive; the old stories say, when she’s agitated, Ruthie moves pictures on the wall, rearranges cash drawers, or throws merchandise across the room. I read about Ruthie in an article published here ten years ago -- I’m not sure if she’s still active there. And now for two stories a little “closer to home” for me. It’s not that I believe in ghosts - it’s just that I’ve worked with some people that do. In fact, two of my former co-workers at the printing company reported seeing a ghost in the back room of our front office. One of the ladies even took the time to draw what she had seen: a woman in a long dress - a dress like you’d see in a western movie. The ghost had long hair that was put up in a bun. The other of my co-workers said she saw the exact same “woman” by the back door leading into the same room, and together they discussed the drawing, refining their mutual memories on the paper. “What was the ghost doing?” we asked. I looked back toward the area she mentioned, and noticed a shaft of light coming through the transom of the room’s back door, where the evening sun was beaming brightly through and bouncing warmly off of the red floor. I was doubtful. “Could it have been the sunlight?” I asked. “She was in the sunlight,” she said as she worked on her drawing. There was emerging on paper a very clear picture of a turn-of-the-century woman. She looked kindly. Of course, word of the sighting carried quickly through the print shop and it was the subject of much discussion, most of it very doubtful, until a presswoman saw the picture. “Oh, I’ve seen her several times,” she said. It was very plainly spoken. This particular presswoman was known for her bluntness and her matter-of-fact demeanor. She was talented and didn’t mind telling you what she thought. Together the two continued discussing the drawing, each adding details to the other’s memory, until a fairly complete picture emerged, even down to the color of the dress and the color of the hair of the kindly ghost. I have never seen the ghost at the print shop, though I am reluctant to work there alone, after dark. The old building makes lots of strange noises at night. I have, however, seen what I thought was a ghost at the old Charles Schreiner mansion on Earl Garrett Street in downtown Kerrville. I remember as a boy being convinced that the Charles Schreiner Mansion on Earl Garrett Street was haunted. In those days it wasn't a museum. It was just a big vacant mystery, filled with cobwebs and the stale smell of emptiness. I remember one October night, many years ago, seeing the flickering light of a candle moving from the second story windows of the turret room and heading slowly, creepily toward the store;the light moving steadily, stiffly through the big ballroom on the upper floor. As it approached the last window, half-hidden by the bent pinion pine, it stopped and moved closer to the window pane. The oval of a face was faintly illuminated, a small man with a silver mustache. It peered through the window, out toward the street, and looked at us, two boys scared to death. Our faces must have been white with fear. The eyes looked calmly at us. The lips moved slightly, forming a hint of a smile. And then suddenly the candle went out, and the window was black. My friend and I understood instinctively that we needed to be moving along, and right then, so I don’t know what became of the old kind face in the window. Maybe it’s there tonight, looking out across Mountain Street, wondering where the Tomlinson Building came from, waiting for the two boys to come back. Ghosts -- do you believe in them? I know some folks who do, who’ve seen and heard some strange things. One thing is for sure: ghosts sure make a good story.